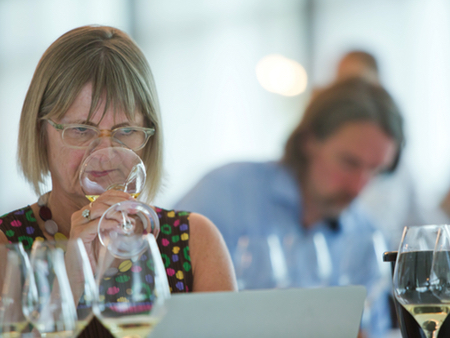 Jancis Robinson at the VDP‘s 2016 GG sneak preview in Wiesbaden. with eyes to see, fail to do so? Alas, many have subsequently failed to do so, as the international renown which German wines enjoyed in André Simon’s youth was remorselessly destroyed both by the political conflicts of the 20th century and by the misguided marketing policies of its leading exporters, of whom, indeed, Fritz Hallgarten was one. The modern history of German viticulture has to begin with the German—in reality, European Community—Wine Law of 1971, to which developments over the last twenty years are in large part a belated and necessary reaction. The chief defects of the 1971 Wine Law were threefold: 1. It permitted no distinction on the label between individual vineyards (Einzellagen) and collective sites (Grosslagen), the latter by definition of lower quality; 2. The grape varieties were not always specified, allowing the blending of quality grapes, above all Riesling, with lesser varietals without any indication on the label; 3. The Law made no attempt to regulate or restrict yields in the interests of quality. On this latter point, it is a common misconception that yields in German vineyards were traditionally very high. The reverse is true, not least on account of their northern latitude and harsh climate. From the 1930s to the 1960s, barring exceptional years, yields mostly ranged between 40 and 50 hectoliters per hectare (427 to 534 gallons per acre). The real damage came later, in the 1970s and 1980s, when the advent of new crossings, bred specifically to ripen earlier, to be more frost-resistant, and to produce greater quantities of juice per bunch, drove annual yields up to 90 over even 100 hectoliters per hectare (961 to 1070 gallons per acre) on occasion. The only legal change came in 1994, with a revised German Wine Law which in point of fact contained hardly any substantial revisions at all! It failed to address the deficiencies of the 1971 Law, but introduced yet another quality category, that of Qualitätswein garantierten Ursprungs (Quality Wine of Guaranteed Origin), for wines from a specific vineyard or village which were subject to more stringent controls in terms of typicity and origin. It is quite bizarre that the first to use the QgU designation was a group of Moselle growers on the Luxemburg border who produced not simply a dry wine, but an Obermosel trocken made from the Elbling grape, not Riesling! It is perhaps not surprising that the predicate QgU has subsequently sunk without trace. Above all, the 1994 amended law did nothing to address the scandal of Grosslagen, and, though it prescribed increased minimum must weights for quality wines with predicate (i.e., from Kabinett upwards), feebly sought to limit yields by stating that they should not exceed the average of the previous ten years for the appellation in question, with the result that yield continued to top 100 hl/ha in many instances. Since 1971, and especially over the last twenty years, a reaction has set into a state of affairs which has consigned German wine to mediocrity or irrelevance in overseas markets, except for a hardy band of top-class producers, the Association of German Quality Wine Estates (Verband Deutscher Prädikats- und Qualitätsweingüter, or VDP for short), founded in 1910. The two principal spurs to reform have been consumer preference within Germany itself and climate change. Evidence for the latter is, as in all matters concerning the environment, still subjective and impressionistic. Nevertheless, if we review the decades from the 1960s in the Rhine and Moselle it is clear that there were usually between four and five indifferent vintages per decade (including some utter wipe-outs in the 1960s). Since 2000, however, there has been only one poor vintage—2000 itself—, with 2008 a taut but none the less classical Kabinett vintage. 2003 was (as in many other parts of Europe) if anything too hot, not a problem with which German growers have had to contend in the past. Of course, painting with such a broad brush obscures many variations and difficulties. The much lauded 2001 vintage, for instance, was a success in the teeth of adversity, and in the long run will probably be outshone, at least on the Moselle, by the 1999 vintage, whereas 2005 was blessed with an even and consistent growing season from budburst to harvest and in effect made itself, and that appears to hold good for the 2009 vintage as well. The increasing ripeness (of the must, measured in Germany by degrees Oechsle) has benefited Riesling, as a late-ripening varietal, in particular, but it has also enabled growers to ferment their wines through, that is to convert more sugar into alcohol, to a greater extent than hitherto without sacrificing fruit, or, more precisely, the balance between fruit and acidity which is the hallmark of all great German white wine, and above all Riesling. It is precisely this balance which has been the source of so much confusion on the part of German consumers. German wines at quality-level are divided into categories of increasing ripeness and sweetness, from Kabinett through Auslese to Trockenbeerenauslese, but they still retain—or should retain—that crucial balance. No German wines of this kind are ever bone-dry; most, below dessert-wine level, are off-dry, a term in German hitherto fatefully rendered as lieblich, with inescapable connotations of bland sweetness. It is therefore commonly supposed that such wines, specifically at Kabinett or Spätlese (late-picked) level, cannot accompany food, even though the rise in popularity of spicy Asian food has shown these wines—alongside Alsatian Gewürztraminers and Muscats, or Austrian Grüner Veltliners—to be an ideal match for this cuisine. The point which is invariably missed is that the ripe acidity of the Riesling grape effortlessly cuts through even the richest sauces and that there is accordingly no reason, apart from individual preference, to choose bone-dry rather than off-dry wines to drink with food. Even twenty years ago German growers were making 70 percent or more of their wine dry, to suit their domestic market, though many were only too eager to assure British wine merchants, operating in a market which at that time had no interest in dry German wines, that they regarded this development as a complete aberration, but one before which they must bow if they were to stay in business. In the meantime, the figure now often exceeds 90 percent. There can be no doubt that the reaction against wines perceived as sweet and ill-suited to food has been largely driven by fashion and snobbery. As Germans began to travel more widely and to experience the wines of other European countries, especially Mediterranean ones, they realized that German Riesling was unique among other off-dry wines, inasmuch as its florality and low alcohol found no counterpart in, say, a demi-sec Vourvray from the Loire, and therefore concluded that it could or should not be drunk in similar circumstances. Exposure to the wines of the New World merely enhanced this prejudice, for the high alcohol levels of many of these wines, at 14 percent or above, made traditional off-dry German wines with alcohol levels of between 7 and 9 degrees (or even lower for Beerenauslese upwards) seem anaemic by comparison: they were perceived to lack, in that dreadful jargon, mouthfeel. At the same time, the owners of some of Germany’s most famous estates were becoming increasingly alarmed by the diminishing reputation of their wines and chafed at the restrictions—or rather, undue laxity—of the German legislation then in force. In 1984 thirty Rheingau growers, with Graf Matuschka-Greiffenclau of Schloss Vollrads and Dr. Hans Ambrosi, director of the Rheingau State Domain vineyards at their head, founded the Charta association to restore the prestige which their wines had enjoyed a century earlier. All wines, which had to be submitted to an independent, not state-controlled, tasting panel, had to be 100 percent Riesling and with an acidity of at least 7.5 grams per liter, with very little residual sugar, and Oechsle levels significantly higher for each quality category than prescribed by the legal minimum. The aim was to produce, not bone-dry wines, but concentrated off-dry wines, known as halbtrocken, especially at Kabinett or Spätlese level. But note here the nomenclature: halbtrocken (now superseded by another term, feinherb, to which I shall come in due course) was a response to wines which were regarded as too sweet, yet technically in English they would all be designated as off-dry. Alongside these wines genuinely trocken (bone-dry) wines and even Diabetikerweine, with no more than 4.5 grams of residual sugar, began to appear, which may have satisfied dietary requirements but scarcely discerning palates. By 1999 the Charta members had joined forces with the VDP producers of the Rheingau as promoters of dry German wines, which now account for around one-third of total Rheingau production. That was the initiative of growers in only one designated area, and until the VDP initiative of 2002 found no imitators elsewhere. Consumers might be forgiven for their confusion at dry wines produced from traditionally sweet categories such as Spätlese and Auslese. As a result, it was decided officially in 2000 to dispense with designations such as trocken and halbtrocken and replace them with two new categories, Classic and Selection—note the use of English rather than German. These changes were approved by the European Commission in Brussels in July 2000. These easily memorized categories specified, in the case of Classic, wines which are dry but which display an intensity of flavour, achieved by a minimum alcohol level of 12 percent (or, in the case of the Moselle, 11.5 percent), where the maximum sugar level may be twice the acid level, but no more than 15 grams of sugar per liter. Selection—in effect a Spätlese trocken goes one stage further by specifying wines from a single site with reduced yields and hand-picking, with the release of the wines held back until the following September. Yet, although these designations were intended to achieve higher quality across the board, chaptalization (the controlled addition of sugar) was permitted for both Classic and Selection wines, a procedure explicitly banned for Qualitätsweine mit Prädikat, and which can only be regarded as a retrograde step. It is perhaps symptomatic of the confusion within the German wine industry—and the German wine public—which these changes have occasioned that the new designations, although legally sanctioned, have entirely failed to catch on. Only the term Erstes Gewächs, literally ‘first growth,’ has established itself as the legally recognized term for dry Riesling from top Rheingau sites. Under the Erstes Gewächs label in the Rheingau, yields were limited to 50 hectoliters per hectare. In a conscious echo of French grands crus not only was production capped at between 2 and 3 percent of total Rheingau production; a minimum price was set, initially 25.00 Deutsche marks (£7.50, or today €8.60), at which the wines could be sold (today as a result of inflation the minimum prices are much higher). The attempt to set a minimum price was quite unprecedented, and it went hand-in-hand with a further recommendation that the wines be marketed in a distinctive Rheingau blue flute bottle (as opposed to the customary brown). These attempts by top Rheingau growers to set clear blue water, as it were, between themselves and other growers culminated two years later in the accord reached by the VDP which regulated the criteria for great growths, first growths, and wines from classified sites throughout the whole of the Rhine and Moselle. This accord signaled a profound reorientation in the production of fine German Riesling. Significantly, twenty years on, it has still to be sanctioned in law. Two notable features of the 2002 VDP agreement were, first, a clause which permitted members in the constituent wine-growing regions to introduce even stricter conditions over yields, must weight, and site demarcation if they so chose, and, second, a clause stating that the production of great growths (Grosse Gewächse) or first growths (Erste Gewächse) should be voluntary; that is to say, VDP members were not bound to produce exclusively great growths—nor could they have been. Beyond these concessions, great growths had to fulfill five criteria: 1. Yields were to be restricted to 50 hl/ha; 2. Grapes must be harvested by hand; 3. Grapes must be ripe enough to qualify for Spätlese (late-picked) category [though chaptalization is allowed]; 4. Great growths should be dry in style; 5. Great growths should be produced exclusively from varietals deemed traditional by the regional winegrowers’ associations. In practice, this meant in the major growing regions Riesling, with the addition in the Palatinate of Weissburgunder (Pinot Blanc) and Spätburgunder (Pinot Noir). Further clauses regulated marketing and packaging, including the provision we have already encountered that wines should not be released until the September following the harvest. Below the category of Grosses Gewächs (GG) a second tier of wines from classified sites was permitted, with yields of up to 65 hl/ha. The third and fourth tiers of Orts- und Gutsweine (estate and village wines) need not detain us, since these wines are rarely seen in export markets. Whether this classification will have much impact on the bulk of German wines, given that it is restricted to VDP members, is doubtful. Moreover, it is not at all clear how some vineyards and growers found their way onto the list in the first place. The parallels with Alsace spring immediately to mind, where the grand cru system, again voluntary not mandatory, has arbitrarily excluded certain vineyards, sometimes on the grounds of mixed varietal plantings, while some distinguished growers have simply refused to participate. Beyond the remit of the VDP (which only accounts for a fraction of wine production on the Rhine and Moselle, though it has members in Franconia, Württemberg, and Baden as well) further changes have been introduced. The most significant of these was the pioneering of a new term—or rather an old term, common in the early twentieth century and now revived,—namely feinherb, in place of the previous halbtrocken. Unfortunately, the German word feinherb itself a neologism—is completely untranslatable in any direct fashion into other languages; for wine, it certainly cannot be rendered as ‘bittersweet.’ What the term is seeking to indicate is a balance between fruit and acidity: off-dry wine with elegance and depth of flavor. It is difficult to avoid the conclusion that the German love of classification has led to more confusion than clarity, an impression only confirmed by the recent introduction on the Moselle of yet another designation, Riesling S, to denote wines which are dry, harvested from specified sites, and which have passed a strict tasting panel, without qualifying as ‘first-rate sites’ (Erste Lagen). The superimposition of new categories of designation, even if several have failed to establish themselves, has left a terminological wilderness, with signposts pointing in seemingly contradictory directions. So far my remarks have concentrated on quality wines at Kabinett and Spätlese level. But it is necessary to say something about German sweet and dessert wines as well, on which recent legislation has had less of an impact. The problem, in a nutshell, is what to expect from wines labeled Auslese, that is, wines made from selected bunches of ripe grapes, some of which may be affected by botrytis. From those which are not it is possible to make a dry Auslese, as some growers indeed do, believing this to have been a style much sought after in the late nineteenth century, though nowadays such wines are usually labeled as Spätlesen. The fact is that Auslese wines fall into two different brackets: those which are semi-sweet, with an indicative sugar level of between 30 and 60 grams per liter; and those which are truly sweet (with some botrytis), with sugar levels between 100 and 150 grams per liter. The sizeable gap between these sugar levels is in itself an indication that Auslesen can embrace both off-dry wines veering towards medium-sweet (very common on the Moselle, where the minimum Oechsle requirement is lower than on the Rhine), and sweet dessert Auslesen. The latter are often distinguished by supplementary labeling, such as Goldkapsel (gold capsule), a star system, or by Fuder (vat) number. They are correspondingly more expensive than ordinary Auslesen. Above Auslesen come Beerenauslesen (selected bunches of botrytis-affected grapes); Trockenbeerenauslesen, made from botrytized berries which have shrivelled on the vine and thereby achieved even higher concentration and must weight; and a new category which first appeared in the 1960s, namely Eiswein, that is, berries concentrated by being frozen on the vine and harvested while still frozen. Previously such wines were regarded as a fortuitous and rare bonus, being harvested in December or even January of the following year, as their names in German, Nikolauswein (for wines picked around December 6) or Dreikönigswein (for wines picked around Epiphany, or Feast of the Magi, i.e., January 6) indicate. Initially, Eiswein could appear on the label alongside Beeren- or Trockenberenauslese, but since 1982 Eiswein has enjoyed a separate Prädikat (quality designation of its own). At the outset, some Eiswein was also botrytized, but nowadays they are usually without botrytis, though that is not a legal requirement. What is not permitted by law is the artificial freezing of either grapes or wine, known as cryoextraction, as sometimes practiced in Sauternes, or reverse osmosis. The minimum alcohol for these three dessert categories is 5.5 percent. My own view is that Eiswein is less interesting than Beerenauslese, since it emphasizes concentration and intensity of flavor over site-specificity and nuance of flavor. And that brings me to my concluding reflections. The current popularity of dry wines, or of off-dry wines at the dry end of the spectrum, stems, in my judgment, less from the perceived sweetness of traditional German wines—though florality is a more accurate term than sweetness—than from their alleged lack of intensity. A wine at 7 or 8 percent, precisely because it is low in alcohol, can display and reflect nuances of site, soil, and exposure which are transmitted through its acidity or the minerals contained therein. These nuances recede, or are overlain, as the alcohol increases. That, of course, applies to German Rieslings, not to the lesser varietals which have no subtlety in the first place. The increase in alcohol of 4 degrees or more which the new wave of German dry wines achieves may impart greater intensity of flavour (mouthfeel), but at the same time alters the intrinsic character of the Riesling grape as grown in Germany, stripping it of its ethereal elegance, subtlety, and haunting delicacy, and making it much more like Rieslings grown elsewhere in the world. Since there is an abundance of fine dry Rieslings in Alsace and Austria, not to mention Australia and New Zealand, it is not clear what is to be gained by sacrificing the very features that have made German Rieslings so distinctive [see also: “What’s the Matter with Grosses Gewächs” and “Terry Theise’s ‘Dry German Riesling’” for more on this]. André L. Simon and S. F. Hallgarten, The Great Wines of Germany and Its Famed Vineyards (New York/London, 1963), p. 11. Ibid., p. 72. In an amendment to the 1971 Law, it was determined that no quality wine may originate from two districts, even if the vineyards are adjacent, the only exception being Liebfraumilch! See S. F. Hallgarten, German Wines (London, 1976), p. 159. The 1971 Law stipulated that Liebfraumilch must contain residual sugar, therefore it cannot be dry, but in a bizarre twist there is nothing in the 1971 Law which states that Liebfraumilch must be a blend; in theory, it could come from an individual site. Ibid., pp. 212-14. As I can attest, as a regular attender at the annual VDP London tastings in the Victoria & Albert Museum in the 1980s and 1990s. It is sometimes forgotten that the diethylene glycol scandal in Germany in 1985 (though never on the scale of Austria’s) stemmed as much from a desire to impart greater weight to the wines on the palate through higher glycerine as from a desire to make already off-dry wines any sweeter. See Stuart Pigott, Life Beyond Liebfraumilch. Understanding German Fine Wine (London, 1988), pp. 59-70. Press conference statement following the VDP meeting at Castell/Franconia, 19 June 2002. Moselle Auslese 83  degrees Oechsle; Rheingau Auslese 95 degrees Oechsle. The equivalent figures for Beerenauslese/Eiswein are: Mosel 110 degrees; Rheingau 125 degrees, though Trockenbeerenauslese is 150 degrees in all regions. Given the time constraints of the lecture, it was not possible to review developments in the former East Germany, or in Franconia, Baden, and Württemberg. Equally, nothing has been said about organic wines which in Germany, despite the high profile of the Green Party, have not attracted the interest one might have expected. In general, it is highly revealing that there has been no comprehensive survey of German wines published in the last twenty years, despite – or perhaps because of – the welter of changes which have occurred. Readers may wish to consult to VDP website: www.vdp.de. Tom Scott is an honorary professor in the Department of History at the University of St. Andrews, having previously spent over three decades in Liverpool, where he built up a small wine business. For the first edition of Jancis Robinson’s Oxford Companion to Wine, he was invited to contribute the article on the history of German wine. I raise my questions or objections to Scott’s text in order of appearance. His still strikes me as an odd trio of allegedly prime objections to the 1971 Wine Law. It’s as if he wanted to avoid the elephant of Oechslemania in the room. Exclusive and obsessive fixation on must weight would surely head most observers’ list of 1971 sins, as it does mine. Other egregious matters not mentioned by Scott include the coopting of “Kabinett” and its unforeseen consequences; the design, disparity and heterogeneity of Einzellagen; the exclusion of other vineyard designations; and, apropos exclusion, the law’s draconian underlying axiom that any sort of information which is not expressly required on a wine’s label is forbidden. But it is an unnecessary exaggeration. If one believes as I do that there is such a thing as synergistic wine and food combinations (consequently also ones that mask or conflict), then choices should be made with that in mind. And in fact it seems obvious to my palate that there are some circumstances in which a non-trocken Riesling tends to be better suited than a trocken one and many others in which the reverse is the case. Scott’s phrase “technically in English they would all be designated as off-dry” is very odd because I know of no “technical” definition or specific parameters for that English expression. Scott’s perspective on the Rheingau’s Charta is misleading. By the time the Charta had become well-established in the late 1980s, a major share of Pfalz Riesling from the top sites and growers was once again legally trocken and if there wasn’t an organized “initiative,” there was certainly a very efficacious movement toward dryness in the Pfalz that then gained enormous momentum in the early 1990s. First off, many Rheingau Erste Gewächse (to the extent they were legally trocken) were already in 2011 being presented as Grosse Gewächse and described as such by their growers. In 2012, Rheingau growers were asked by the VDP to defer to the analytic/stylistic parameters and nomenclature of Grosses Gewächs. But it was and remains beyond the discretion of any grower organization to eliminate Erstes Gewächs as a category of Rheingau wine since it is enshrined in Hessian State Law. As for “Erste Lage,” that term was being widely used on the Mosel at the time not as a preferred alternative to “Grosses Gewächs,” but rather because the wines so-labeled weren’t trocken. Many Mosel growers who did bottle trocken wines from top sites (e.g. Grans-Fassian, von Kesselstatt) began offering them under the name “Grosses Gewächs” as soon as the category was established. It’s true that the term “Erste Lage” has a confusing and convoluted recent German history, but already as of June, 2006 – to quote another VDP press release – it had been determined that the term “Erste Lage is the unifying umbrella concept [einheitlicher Oberbegriff] in all regions for wines of the uppermost category.” In other words – as the official wording goes on to make clear – Grosses Gewächs was now defined as a trocken wine from an Erste Lage. “Grosses Gewächs” continued as an attribute of wines, whereas “Erste Lage” (which, given its literal meaning, one would have thought obvious ;- ) henceforth referred solely to vineyard sites. Whence this notion of two brackets? There is in fact a continuum of wines labeled “Auslese” from trocken through extremely sweet. But, if anything, isn’t that Prädikat used most often for overtly sweet wines that harbor 80-100 grams of residual sugar and thus fall between Scott’s two alleged brackets? The account of “Goldkapsel,” “stars,” and fuder designations is quite misleading too, but suffice it to point out that their use is a) by no means restricted to wines of Auslese Prädikat, and b) entirely a matter of winery-internal convention and hence unamenable to any unified account. And whence this notion of Scott’s that on the Mosel in particular there is a tendency to bottle Auslesen “veering toward medium-sweet[ness]”(whatever exactly that is supposed to mean)? In my experience, any notion that the best Eiswein are inherently less complex, less nuanced and less capable of testifying to their vineyard of origin than are the best Beerenauslesen is purely tendentious. 1) For Eiswein, growers often choose a site with a proclivity to freeze but that is not otherwise a source of the most complex or fascinating wines. So if the wines are less complex or otherwise remarkable it’s often precisely because they DO reflect their sites. Since many of the acknowledged top sites earned their reputations precisely by being warmer than ones nearby, there are often few if any portions of a top Einzellage where it would ever freeze sufficiently to render Eiswein (Hans Leo Christoffel said he farmed Ürziger Würzgarten for more than three decades before he discovered such a spot, and then he risked his BWM and his own life trying to get the grapes off the ledge in question.) But where a top site also has a proclivity to freeze deeply (e.g. Oberhäuser Brücke) one gets Eiswein at least as sensational as any Beerenauslese from that same site. 2) In order to protect the grapes from birds, vines intended for Eiswein are nowadays very often wrapped in semi-porous film. This changes not only the rules but the conditions under which grapes become Eiswein. And the humid hothouse environment that is generated is in my opinion (one quite widely shared) a reason why so many contemporary Eisweine lack the clarity and precision that are (or at least ought to be) among that genre’s virtues. Floral notes are a matter of olfaction or retro-faction whereas sweetness is a matter of taste. Moreover, if “florality” means anything then it means resembling the perfume of flowers, which implies as vast a range of possible aromas as “fruitiness” would of flavors. By contrast, “sweetness” serves an entirely different function and refers to one particular aspect of taste perception that can be graded on a scale of intensity. I ask forgiveness for ending in self-quotation from another extended 2011 polemic in which I felt myself compelled to engage (this one with Joel Payne, published in The World of Fine Wine, Issue 32). So to anyone who has read this far, I would first just like to extend my sympathy and condolences for that fact alone; but also, to plead innocent to any charge of unnecessary complication or pedantry. As long as those trying to legislate labeling, classify vineyards, define stylistic parameters and then market their brain children to the wine loving public at large persist in complicating, confusing and obfuscating, for just that long, trying to point this out and to head things in the direction of simplicity and conceptual clarity is itself going to be a task full of complication and devilish detail. But the thing we can least afford as German Riesling lovers, if we wish to enlighten others to this genre’s beauty, is for well-meaning commentators like Scott or Payne to add muddle and confusion on top of that which Germany’s Wine Law and the VDP have already perpetrated. Mea maxima culpa. The 2011 talk should have been updated (I only sent it to Lars because he hadn’t seen it) — and I had forgotten that I had sent it to Jancis and that David had replied! There is no point in going over the criticisms which David made, and which I accept. Of more interest to readers is where we stand now. I agree that things have moved on since 2011, but there are still several points which positively encourage ‘muddle’. If it were possible to discard the ‘elephant in the room’ what system could replace it which would accurately reflect the quality of Kabinett wines? There seems to be general agreement that Kabinetts are unfairly sidelined when it comes to awarding, let us say, Parker-points. Over the unresolvable argument about what wines in the late nineteenth century tasted like (or were supposed to taste like) it is worth recalling that more than a decade ago Peter Jordan (alas deceased) bought the Saar estate which has now reverted via Bitburg brewery ownership to its old name of Van Volxem, convinced that he had (re-)discovered the authentic Saar Riesling style made dry Auslesen — almost a prefiguration of Grosses Gewaechs! Not many people were convinced by his argument or the wines. I am as picky about language as David, but I would still wish to make a case for ‘florality’: a) because it avoids the perils of ‘sweet’ and b) because ‘fruity’ is so vague a term as to be pretty useless. You can say that all Rieslings, including Alsace, Austria, or South Australia, are in some sense ‘fruity’, but German Rieslings surely have a distinctive nose and flavour, for which we need a designation. If ‘florality’ is unacceptable, I invite suggestions for an alternative. It would be useful to set these issues in a wider context. I would be grateful to read informed comparisons with Alsace Riesling (or Alsace wines in general) where a ‘ladder of progression’ from dry to sweet exists, and which is even less clearly defined or regulated than the reviled Oechsle system. One brief thought on GG. Although I am a Riesling man through and through, much of my time in Germany has been spent in Baden, where Riesling, except in the Ortenau (Middle Baden) is rarely seen. There I can see real quality in GG made from Weissburgunder (pinot blanc) or Grauburgunder (pinot gris). I don’t think Riesling in Germany achieves the same impact. If one wants a GG Riesling, would one not naturally be more likely to look to Alsace? Thank for your reply, Tom. Better late than never. That’s right. You sent your 2011 lecture for me to read, and I later offered to publish it. But I should have asked you for an updated text. It’s my fault. Over the last several years, Riesling Kabinetts—with noticeable residual sugar—have been in vogue, even in Germany, and often receive high scores by various critcs. Just the other day, Martin Zwick had his annual BerlinKabinettCup. I recall that Peter Jordan had an illness, but I didn’t know that he passed away. It’s true that 19th-century Saar Riesling was more often dry or dry-tasting. The wines, however, had less alcohol than today’s GGs. I agree that “sweet” and “fruity” are not ideal descriptors. Alsace has had problems with having Riesling wines that are assumed to be dry but actually have residual sugar and high alcohol. Despite my issues with the GG category, there are some excellent Riesling GGs that are just as good, if not better, than the best dry Alsatian Rieslings. A crank, perhaps, but a well-informed one. The original text seems misinformed or too casual for this environment. The thing I find so bizarrely interesting about this whole scenario is this: Lars, wonderful man that you are, you have a very small site visited by German wine fanatics and Riesling experts the world over. The text published here has less to contribute than virtually any subscriber that might comment on it. It’s sort of like President Trump walking into a meeting with the Joint Chiefs of Staff and offering an opinion or me strolling over to MIT and offering my ‘expertise’ to Junot Diaz on how he might want to edit the novel he’s currently working on. I further think that (at least from an American’s perspective), the article totally misses key issues like the ‘natural wine’ trend, the rise of the ‘sommelier’, the geo-political importance of Germany in the EU, and the deaths of the generation of people that remember World War II, while over-simplifying or just missing salient aspects of climate change (largely, the summation of the article being pretty much at odds with the commentary on climate change). Carl, I’m glad you spoke up. Your comment is well taken. I wanted to be fair to Tom and give him a platform to voice his opinion. But, as David pointed out, Tom should have sent me a revised edition of his text. Thanks for your response, Tom, and the excellent challenges you raise. The monster of Oechslomania is not easily laid. The VDP, just like Austria’s lawgiver, made a big deal of escaping from its allegedly inherently Teutonic clutches and throwing themselves into the arms of an approach that the Austrians call “romantic” (as in “Romance languages”). Yet regardless of Austria’s faux-French DACs and the VDP’s faux-Burgundian classificatory hierarchy what have both ended up doing? Prioritizing must-weight! Thus, a certain minimum must be achieved to qualify for a DAC, a higher weight to qualify as DAC Reserve, and – sacré bleu! – even the right to utilizing the name of an Austrian Erste Lage now comes with a must weight requirement. For its part, the VDP has tried to marginalize Kabinett – though I am happy to say, signs are that they won’t completely succeed – for no stated reason other than the totally baseless claim that such wines are too weak to reflect much less do justice to a great site. Naturally, to find the real motivation, as in far too many matters of VDP regulation, follow the money: What matters isn’t evidence connecting style and terroir, but rather marketing. As you say, Kabinett lost respect because the 1971 law made it a sign of the minimum must weight deemed worthy of Prädikat, so it became the much-abused basement, price-wise. How to repair the damage done to “Kabinett” or my Oechslomania generally? Well, in exactly the way that it’s now being done by folks like the band of German growers behind Klaus Keller’s brainchild “Go Kabi Go!” and its road shows designed to showcase the virtues of alcoholic levity; or by Keller and Müller when they achieve sky-high auction prices for Kabinett; or by any grower who encourages his or her customers to appreciate the virtues of alcoholic levity, consummate refreshment, animation and transparency in Riesling and then explains “you know, we have a nice name for this, even if that’s not how the name was used back when our ancestors borrowed it from the Brits: ‘Kabinett.’ Nice ring to it, don’t you think?” And incidentally, without resorting to any special terminology but rather, on the contrary, by rejecting specialized terminology like “Smaragd” or “DAC Reserve,” Austrian Riesling growers in the Wachau and Kremstal such as Peter Malberg, the Stagårds and the Harms are getting their customers not just to relish lighter-weight Rieslings but to pay premium prices for them. I’m not talking here about residually sweet Riesling gaining renewed respect. That’s important, too, as you emphasize. But I’m talking about Kabinett-levity whether the Kabinett in question is a bone dry Niedermenniger Herrenberg from Hofgut Falkenstein or an unapologetically sweet one of a sort much more familiar to long-time Anglophone devotees of German Riesling. (Indeed, there are growers like Weiser-Künstler that bottle both sorts. And I’m sure I don’t need to reiterate in this forum my praise for wines of hidden, halbtrocken sweetness, very much including alcoholically lightweight ones.) As for all of the bad legal baggage and the ocean of mediocrity legally entitled to be called “Kabinett,” life and human energy are too short to waste on trying to beat one’s head up against Germany’s Wine Law or against the closed minds of many who are determined to replace it with yet more unnecessarily complicated regulations, equally oblivious to unforeseen consequences. As far as I can tell, really widespread usage of “Kabinett” is on the way out. It lacks much of any cache it might once have possessed in the realm of inexpensive, superficially sweet commercial blends; and the VDP’s determination to root-out “Kabinett trocken” is probably going to wean most German consumers off of the term. Those who persist in utilizing it as a term of endearment for lower-alcohol Riesling will eventually have it more or less to themselves. Naturally, even with the headlines of a Keller or Müller, few growers are ready to try selling a Kabinett for more than a Spätlese. But that too will come. And if it doesn’t happen often, that will partly be because one can so often pick a little earlier and at correspondingly lower risk to achieve Kabinett levity, and because to some extent (especially with global warming) that levity will increasingly be associated with higher yields. The reason “Kabinett” retained any resonance or sizzle in trocken-drinking German circles was because of the other role it played in the emergence of the 1971 Wine Law, namely adopting the mantle of “Naturwein” as an imprimatur of quality. I can see some reasons (which Lars will be only too happy to rehearse ;- ) to wax wistful about a term that signifies a wine has not been chaptalized. But the need for chaptalization is nowadays so rare that this becomes less and less of an issue. And as long as we’re saddled with the 1971 Wine Law, at least consumers who care about that issue know that any Riesling bearing a Prädikat cannot have been chaptalized. Peter Jordan was hardly the only proprietor or Riesling promoter of his time to hold-up Auslese (or Spätlese) trocken as a model, and most of the others were responsible for similarly unconvincing wines. But the problem lay with their lack of understanding about what it took in the vineyard or the cellar to achieve excellence in really ripe dry German Riesling. Take a look at growers – I mean by that at proprietors who were personally working their vines and laboring in their cellars – and who during the 1980s were championed ripe, dry Riesling. You’ll find plenty of instances of consistent excellence. I have in mind folks like the Breuer brothers, Ha-Jo Becker, Christine and son Wolfgang Riedel, or Elfroth and Trimpopp (when they collaborated – and cohabitated ;- ) – at Weingut Siegfried Gerhard) all in the Rheingau; or the Magins and Werlés in the Pfalz Mittelhaardt. Since the 1980s, with so much attention having been focused on German grower’s aspirations to world-class dry Riesling, they have gradually achieved that goal, end of subject as far as I am concerned. Which is precisely why I keep asking VDP movers and shakers as well as other influential German wine opinion-makers: “Could we now please move on and concentrate some effort on other styles of Riesling and in particular on styles that few if any other wines in the world can even approximate?” … such as, Kabinett whether it’s completely dry and makes a complete, complex statement yet weighs just 10-11.5% alcohol; or weighs-in at 9-11% and inhabits that middle ground between 10 and 30 grams of residual sugar long-despised and abandoned by Germany’s self-proclaimed Konsequentialists; or sports featherweight 8-9% alcohol and with seeming alchemy causes 30, 40 or 50 grams of residual sugar to disappear and in the process sends shivers down the spine and the salivary glands into overdrive. As is often the case, your comments deserve special mention and should be separate articles. Hofgut Falkenstein, like Weiser-Künstler, also bottles both sorts of Kabinetts (trocken and fruchtsüß), plus off-dry (feinherb), since the 2015 vintage. Thanks, Lars. I can’t believe that I neglected to mention the Webers’ residually sweet Kabinetts, but it is a new development at Hofgut Falkenstein so it momentarily slipped my mind. # … which means that Schloss Johannisberg, the Karthäuserhof, Schloss Saarstein and a few other estates whose own names are eponymous with those of their signature vineyards are able to utilize “Kabinett trocken” essentially as before. What do I mean, “essentially”? Well, technically a Kabinett trocken from Schloss Saarstein is one of their wines that is officially by VDP-reckoning an Ortsriesling from and labeled for the estate Schloss Saarstein, whereas a Schloss Saarstein Kabinett with residual sugar, and also a Grosses Gewächs from Schloss Saarstein are among their wines that are officially single vineyard Serriger Schloss Saarsteiner Rieslings (mutatis mutandi for the other two estates I just mentioned)! Pretty silly stuff, eh … ? You wonder at any legitimately quality-conscious grower not being embarrassed by such a situation. But most of them either avert their attention out of disinterest or simply throw up their hands.